Hailing from Lisbon, Portugal, A.PAUL is one of the most prolific and talented techno artists in the world. With over two decades of experience both as dj and producer, he is today a reference in electronic music, being techno his true passion. He was voted best Portuguese DJ of this style, for several years, and his unique sound, taste, and technique, granted him a position on some of the best mega events like Awakenings (Holland), Evolve (Canada), Nature One (Germany), Rock in Rio (Portugal), Syndicate (Germany), Ruhr-in-Love (Germany), Tecnolandia (Portugal), Aquasella (Spain), Liberty White (Belgium), Decibel (Holland) and clubs like Tresor (Germany), Fabrik (Spain), Row 14 (Spain), Moog (Spain), Panama (Holland), Makumba (Spain), Poema (Holland), U60311 (Germany), Inox (France), Locomia (Portugal), Rocks (Portugal), Kremlin (Portugal), Pacha (Portugal) and many many more. 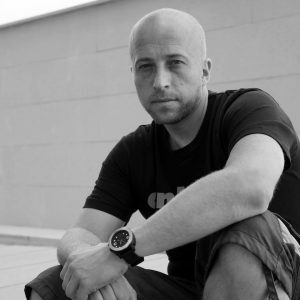 His first record came out in 1995, followed by the creation of his two most remarkable projects from the 90’s, Squeeze Records and Onh.Cet Records, where he released his next EP’s. Later, In 2005, he started his new label Naked Lunch Records, a true bold project, featuring the best techno artists from the planet, with amazing feedback from DJs and fans. 2012 sees the relaunch of Onh.Cet, joining his other projects Parallel 125, Dirty Ego, The Light e Xtractz. Was also co-founder of MPC Distribution with Cisco Ferreira (The Advent) and Michaelangelo.